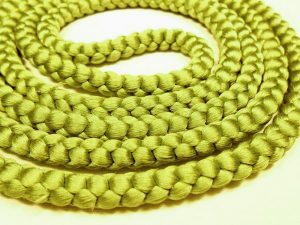 The marugumi obijime (丸組), or „marugumi“ is braided in the traditional japanese kumihimo braiding technique. Like the other obijime types, it is tied by kimono wearers on top of the obi to prevent it from slipping down. A high quality marugumi is braided by hand while most of the market is flooded with affordable machine braided marugumi. The cross-section is round or approximately round. Depending on the braiding technique, the marugumi can be soft or firm. Usually, front and back can’t be distinguished. That’s why marugumi are excellent for beginners – you don’t have to double check if the knot is tied correctly so that the front side is visible. Nevertheless there ARE exceptions (for further details see below…). Guess what: there are formality rules! The range is extending from everyday occasions to ceremonies of the highest level of formality. Just keep in mind: the more formal the occasion the more gorgeous the obijime. And, like always in the kimono world, the application of gold and silver is relevant for the formality. For everyday wear you will choose a marugumi obijime of subdued design and colour. Usually, these are monochrome and without eyecatching elements. An everyday obijime is not about catching someone’s eyes. You won’t see gold and silver here. Nonetheless subtle colour changes could be involved. Or a tiny amount of braiding variations might be applied. Just a tiny little hint of adornment here and there, perceivable only at the second glance, that’s all. This intermediate marugumi section is showing a little bit more glory. Beads, various braiding techniques, a hint of gold or silver – but not too much. Multicolour parts and/or several thinner strands interchanging with a thicker part – those are very elegant eyecatchers. You don’t wear this obijime type with an everyday kimono, rather with tsukesage or houmongi, both of which count as semiformal kimono. 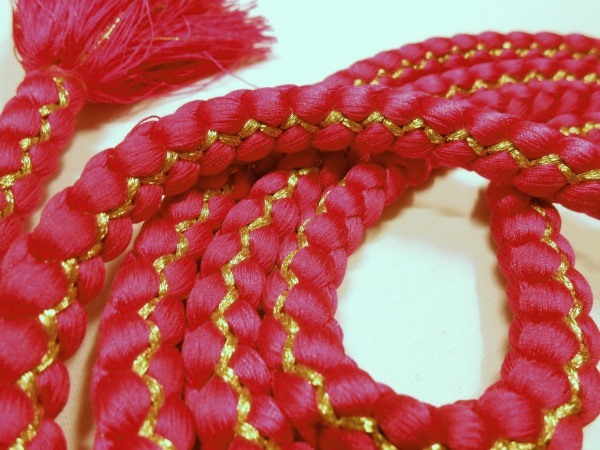 Though there are some semiformal marugumi obijime which can be worn with formal kimono. Sometimes it is hard to distinguish between semiformal and formal obijime. When wearing a furisode kimono, you’ll tie a comparatively thick marugumi. Among the most popular ones ore those in vibrant colours, adorned with gold and/or silver. Additionally, they might be multistranded. 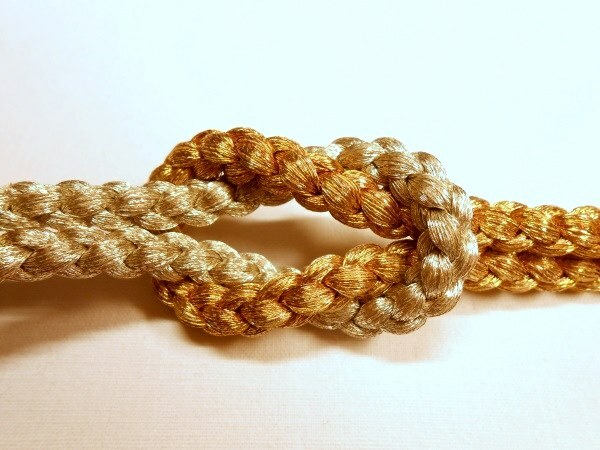 The multistranded obijime often have a front side near the knotting part, where in many cases an amount of beading is visible. 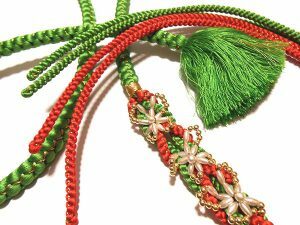 In these cases you have to be careful when tying the knot so that the front side can show off perfectly. Other very formal marugumi obijime are braided with golden and/or silver strands, or even with a combination of the both. Principally, you should keep in mind that the application of gold and silver levels up the formality. There is a tendency towards marugumi obijime among the younger kimono wearers. Especially when the obijime are designed in a more eyecatching style. Thinner marugumi, to start off with the more subdued ones, are put on rather by married women and/or women of a mature age. But nonetheless there are no strict rules, and there is a certain range of options. However most women nowadays choose a hiragumi obijime over a marugumi or maruguke. What is the marugumi made of? 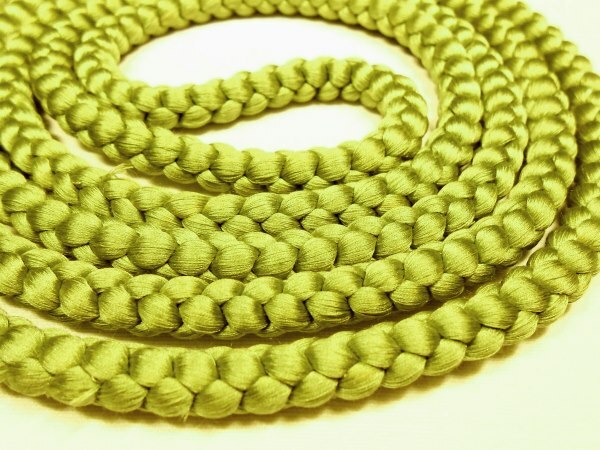 Most round braid cords are made of silk or polyester. But ramie, for example, is an option, too. Formal obijime undoubtedly have to be made of silk. Apart from silk, for less formal obijime polyester is most frequently used. Plant fibres are used less frequently as material for maruguke . 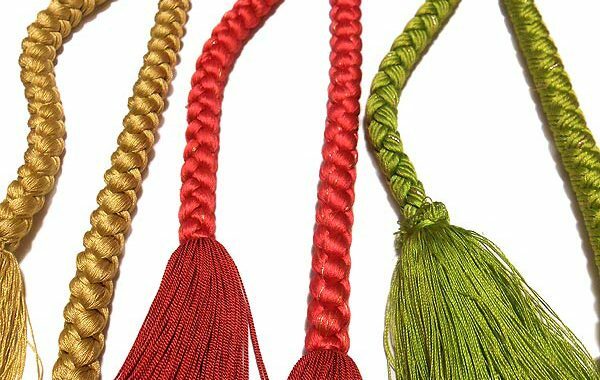 Soft obi cords braided with silk strands tend to show wear all to soon with frequent use. Cords braided firmly, respectively with a firm type of thread don’t wear off so easily. However those are comparatively stiff. Ramie is a very recommended material for frequent use, as it is very resilient and strong. Polyester doesn’t wear off as fast as silk, but it is less resilient than ramie. Let’s check the obijime in stock! 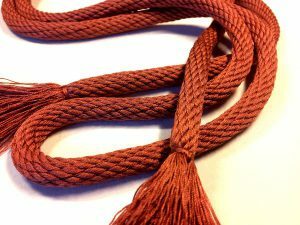 Posted in Beim Tragen sichtbare Kimono-Bestandteile, Kimono-Accessoires, Kimono-Zubehör, Obijime, Start für Kimono-Anfänger and tagged braided cord, braided obijime, formality of obijime, kumihimo, Marugumi, obi cord, obijime, round braid, silk cord, まるぐみ, 丸組, 丸組帯締め.